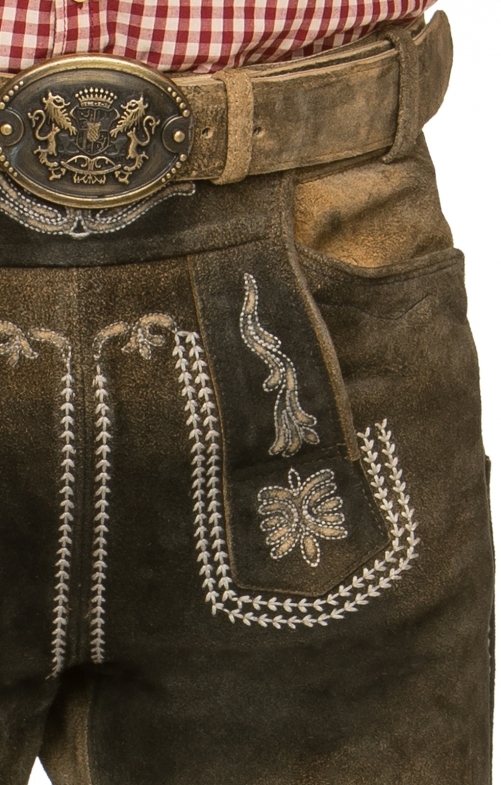 Men's knee-length-Lederhosen Sebastian by Stockerpoint in uroid. The leather trousers made of high-quality tanned wild buckskin leather in deer look are characterised by the unusual vintage look. The embroidery, made after old models, blends perfectly with the buttons in stag horn look. The extraordinary structuring of the leather with antique colour gradients give the model a unique touch. Thanks to lacing on the back of the waistband, the leather trousers can be adjusted in width. The laced waistband at the hem can be adjusted individually. The trousers will be delivered with belt. Typical is the replaceable clasp in brass.